This forum is for reenactors who portray eras set in the Philippines. All students of Philippine history, reenactors or living historians, and people who simply have information to share for the benefit of everyone are welcome here. 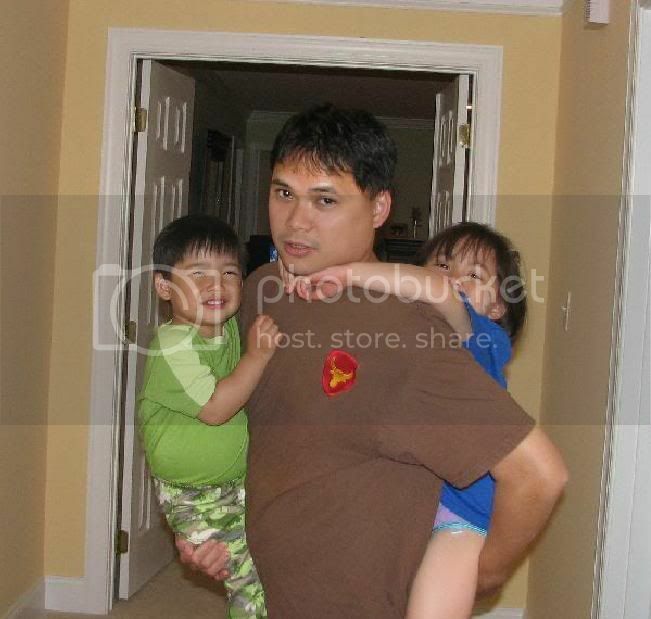 HAPPY FATHER'S DAY TO EVERYONE!!!!! hey vic....and a great forum it is. where would i ever have viewed actual multiple photos of the abucay line? ? nowhere, thats where. keep it up. hey vic....you should be immediately awarded the purple heart, DSC (at least) and combat infantryman badge. seriously, they are adorable kids. hey vic....curious about the photo of the corporal shown eating from his mess kit. is this a picture of a re-enactor or a actual shot taken in 1942 as is indicated in the lower left corner of the photo??? 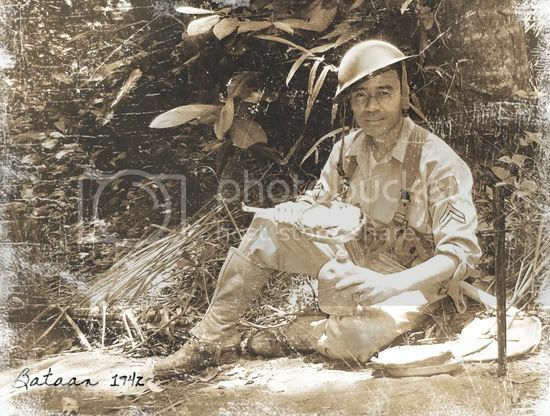 if it is an authenic view of a philippine division trooper it surely is early january 1942 since that mess kit is largely filled with rations whereas if it was taken in late march or first of april i am sure his portions would have been very meager. just wondering, but little things like this worry me to death, although it does keep me occupied in my "golden years" and out of mischief. admin edit: This is the picture that Okla was referring to. It was the masthead picture of the week at that time. hey vic....had it not been the heaping portions of grub in that mess kit i would have been totally fooled. that pic certainly looks like some old, battered pic that had been stored away for eons in an ancient footlocker in the attic. hey 26th...are you saying the good corporal would be a pretty fair "scrounger" ?? lol. Hey Vic....Great shot of all the guys in various uniforms of the period. Where is the statue (in the background) located and what World War II event does it portray? ? I really enjoy the always changing photos that head up this message board. Always something new coming up around the bend every week or so. Great stuff. This current photo is one of the best, methinks. The statue is currently located beside the Army Grandstand at Fort Bonifacio (Formerly Mc Kinley) It used to be at Ayala Avenue but was moved due to construction. The Plaque is gone so I can't be sure but my best guess is it would be a bataan memorial. It is part of a set of national hero statues comissioned in the 70's that were installed at various key crossroads in the main commercial district. The event was the veterans bank and PVAO fun run. See the description above...in events. That's where the statues went! I was looking for them in Makati last year but it was gone. I remember always trying to get glimpses of it as a kid when our car passed through Makati Ave. because they were the statues of my favorite soldiers... then last year when we went home, I was on foot in Makati with a 12x zoom camera ready to take pictures.... alas they were nowhere to be found. Nice to know they weren't scrapped. I'd totally forgotten about them. General Millena reminded me about them a few weeks back. Re statue at the Phil. Army Grandstand, I was told by VFP Sec. Gen. Francisco San Miguel, that it was dedicated to the DBC (Defenders of Bataan and Corregidor). It was formerly placed near the Nielsen Tower, a former airport tower and Paseo de Roxas & Makati Ave were the runways. Hey Guys....Thanks for filling me in per the statue. I would like to see an up close photo of it. Maybe some poster who lives in Manila will do the deed at some point. Thanks again for the update. I think the image of the statue was even used on an album (record) cover at one time. I'm glad to have discovered this forum.